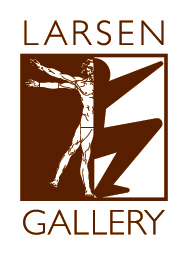 The Larsen Gallery is excited to introduce its newly designed website. It allows for additional content and ease of navigation. We would love to hear your feedback. ARTISTS tab - select to view a listing of Artists whose artwork are currently consigned to the gallery for sale. Select an artist for a listing of available artwork by that artist (just like our old website). Thumbnail images and information including pricing are displayed. Select any specific artwork for additional information and additional images that can be enlarged. ARTWORK tab - hover over this tab to select a listing of artwork that is NEW IN GALLERY or a specific MEDIA (paintings, works on paper, sculpture, etc.). Thumbnail images and information including pricing are displayed. Select any specific artwork for additional information and images that can be enlarged. CONSIGN ARTWORK tab - You can now easily submit artwork for consideration by clicking the CONSIGN ARTWORK button always displayed at the top of the website. A CONSIGN ARTWORK form is provided for you to complete and submit to the gallery. The form is also available under the CONSIGN ARTWORK tab. Also provided under this tab is a partial listing of artists of which we have previously consigned as well as our standard terms and conditions. Gallery information is now constantly displayed at the bottom of each page including links to emails. You can also click the CONTACT tab for contact information, maps and a general inquiry form.